"MOVIE NIGHT OR Honor Pictionary or Book Club?" my mom asks while inflating a blood pressure cuff around my arm. She doesn't mention her favorite of all our post-dinner activities—Phonetic Scrabble. I look up to see that her eyes are already laughing at me. She puts on her stethoscope so that she can listen to my heartbeat. Her smile fades and is replaced by her more serious doctor's face. This is the face her patients most often see— slightly distant, professional, and concerned. I wonder if they find it comforting. theduck - I read the book Everything, Everything by Nicola Yoon. This book is in the romance genre. This book was very interesting and I hung on until the last word. This book was really good ,so I rate it 5 out of 5. Everything, Everything is about a girl named Maddie who is allergic to the outside world and can never go outside ,or she could die. One day through her window she sees a boy moving into the house next to hers. His name is Olly. Maddie and Olly IM all the time and have many similar interests. They also can never see each other and Olly can never come to init Maddie's house. Maddie is afraid of falling in love. Maddie is also shy. Olly on the other hand I think is more outgoing and open. Some of my favorite parts were when the new family arrived it's the house and when Olly try's to get Maddie's attention. I liked these parts because they were romantic and funny. Some parts of the book reminds me of the music of video You Belong With Me by Taylor Swift because in the video Taylor Swift is jealous of the guy he likes girlfriend. Also in the book they communicate by writing signs and showing them to each other through the window, the same is in the music video. Overall this was a great book. Madeline Whittier, a biracial 18-year-old, has severe combined immunodeficiency, a rare condition that renders her allergic to nearly everything and requires her to live inside a carefully sealed environment. Madeline’s contact is limited to her physician mother and her full-time nurse, until handsome Olly moves in next door. Madeline falls for him from her window and begins disobeying the rules that keep her from the outside world. Despite the serious dangers posed by Madeline’s medical condition and Olly’s violently alcoholic father, Yoon’s debut reads breezily. Many chapters consist of single, short paragraphs, as well as emails, chat exchanges, and Madeline’s pithy book reviews (of Lord of the Flies, “Spoiler alert: Boys are savages”). Yoon’s husband provides diagrams, cartoons, and other illustrations that reflect Madeleine’s claustrophobia, whimsical longings, excitement over Olly, and sense of humor. The main conflict is resolved in a few brief pages and reflects an overall tendency for things to happen a bit too easily. Even so, this is an easy romance to get caught up in. Ages 12–up. Agent: Sara Shandler and Joelle Hobeika, Alloy Entertainment. The New York Times Book Review "Gorgeous and lyrical." Entertainment Weekly, A- "[A] fresh, moving debut." Kirkus Reviews, Starred Review "This heartwarming story transcends the ordinary by exploring the hopes, dreams, and inherent risks of love in all of its forms." SLJ, Starred Review "Everything, Everything is wonderful, wonderful." Jennifer Niven, New York Times bestselling author of All the Bright Places "I give all the stars in the sky to Nicola Yoon's sparkling debut. 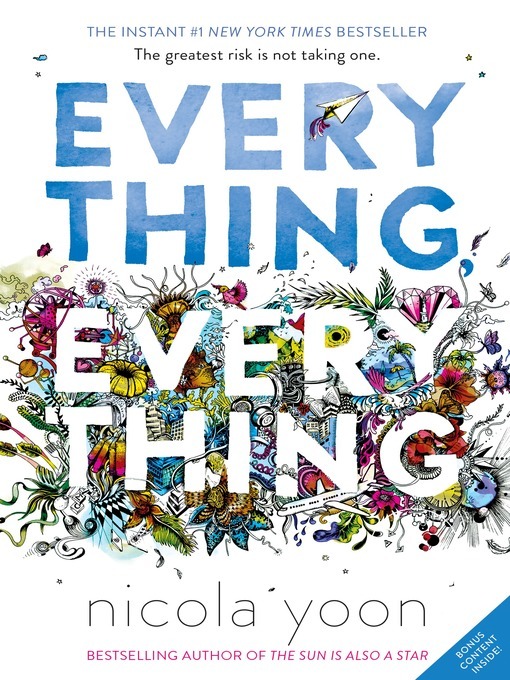 Everything, Everything is everything, everything--powerful, lovely, heart-wrenching, and so absorbing I devoured it in one sitting. It's a wonder. The rare novel that lifts and shatters and fills you all at once." 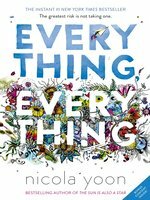 David Arnold, author of Mosquitoland "With her stunning debut, Everything, Everything, Nicola Yoon has constructed an entirely unique and beautiful reading experience. Gorgeous writing meshes with original artwork to tell a love story like no other. You've never read a book like this." Danielle Paige, New York Times bestselling author of Dorothy Must Die "Everything, Everything has everything . . . romance, heart, and intelligence. Nicola Yoon's book and voice stayed with me long after I finished reading." Katie McGarry, author of Nowhere But Here "There's a quiet beauty about Everything, Everything that kept me captivated from start to finish. Olly and Madeline's love story stole my heart." Jodi Picoult, #1 New York Times Bestselling author of Leaving Time "This extraordinary first novel about love so strong it might kill us is too good to feel like a debut. Tender, creative, beautifully written, and with a great twist, Everything, Everything is one of the best books I've read this year." Justine Magazine "A do-not-miss for fans of John Green and Rainbow Rowell (aka everyone)." Publishers Weekly "This is an easy romance to get caught up in." Seventeen "Nicola Yoon's first novel will give you butterflies." Arun Rath, NPR Weekend's All Things Considered "Not only was I totally hooked . . . by the end I was totally blown away." Booklist "Readers will root for the precocious Maddy as she falls hard for the boy next door . . . teens in search of a swoonworthy read will devour." TheGuardian.com "I just couldn't put it down . . . If you're a fan of The Fault in Our Stars, If I Stay or Before I Die, then this book is for you." Brought to you by Friends' Central School, and built with 💕 by OverDrive.